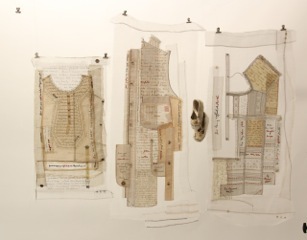 Wu Yu Jung’s Solo Exhibition depicts mended cloth as metaphor for how clothing shapes the identity of the wearer, but also reveals our histories, scars and growth. Her exhibition will document the participants of the mended clothing through artifact, video and photograph, and feature the artist’s experience of visiting her Sister City of San Jose. Born in Korea, Jayoung Yoon is a New York based artist known for using human hair in her art. She focuses on using hair as a medium for exploring systems of thought, perception and sensations of the body. Her use of hair connects the viewer’s visual perception of the work to the physical form of the body. 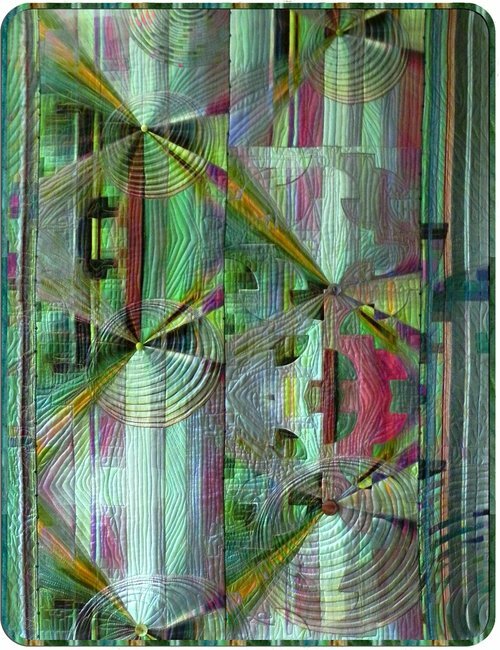 Her creations of 2 dimensional work, of both woven forms and geometric shapes, represent the limbo between conscious and unconscious states. For Mark Newport, textile and skin are intimately connected. Physical proximity causes sweat and strength, dirt and fear, love and cologne to move from flesh to cloth indiscriminately. While cloth protects skin, either can be cut or torn. Stitches are the means to aid healing and measure the intensity of the wound. These works begin by cutting a hole into the cloth. The hole is then filled by weaving with needle and thread. The repairs are made using traditional textile darning and mending techniques learned from studying European and American mending samplers. Whether the area of repair is immediately visible or camouflaged, mending holes leaves a scar that speaks of vulnerability, intimacy, and futility. SJMQT commemorates Miriam Nathan-Roberts, the late Bay Area art quilt pioneer. The exhibit includes several of her iconic works as well as quilts and personal articles never before shown. Nathan-Roberts was well known for illusions of 3D shapes on a 2D surface. Her later work was distinguished by striking, digitally-printed images. The title piece imagines a radical departure for the Museum of Modern Art in New York --- as a venue for art quilts. Patricia A. Montgomery's swing coats illustrate African America women's contributions to the Civil Rights Movement. Each coat represents one unsung heroine such as Ella Josephine Baker, who mentored young civil rights leaders, or Claudette Colvin, a teenager who refused to give up her seat on a segregated bus in Montgomery, Alabama nine months before Rosa Parks’ arrest. The combination of African American quilting traditions, digital images, pastel drawings and thread work are designed into a wearable object, detailing the stories of the Civil Rights Movement heroines. Members of the Surface Design Association are invited to submit work for the 2018 International Juried Members exhibition, The Art of Labor. The exhibition will be held in partnership with the San Jose Museum of Quilts & Textiles (SJMQT) at their location in San Jose, CA, July 22, 2018 – October 14, 2018. The exhibition includes awards. Entries may be submitted online January 8, 2018 – April 6, 2018. Embroidery artist, Maggy Rozycki Hiltner presents a multi-panel project by designing an idealized landscape with a big blue sky, green grass, and puffy white clouds. Upon closer inspection the viewer finds the ways in which humans impact the natural landscape through pollution, coal mining, and industrial waste. Vantage Point is a fabricated world that simultaneously displays potential beauty, and the silent, destructive effects of waste and human consumption. With reference to printmaking, sculpture and illustration, the subtractive art of paper cutting is going through its own Renaissance. As society moves into the digital age, paper, which was once part of our everyday lives, is fading out to more environmentally friendly alternatives. 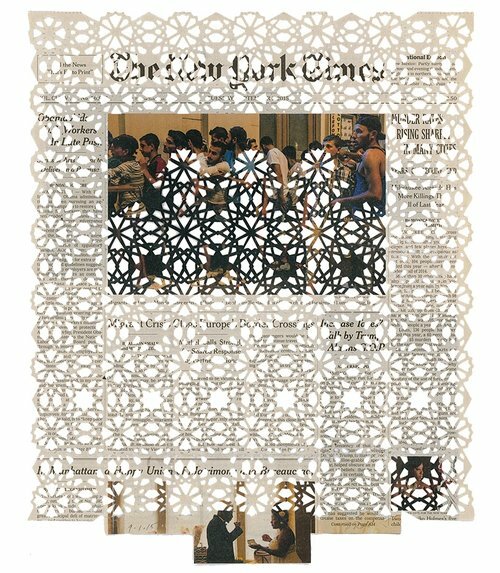 This exhibition pays homage to the art of paper cutting, an activity that has been celebrated since the 4th century. The works in this exhibition document Frau Fiber's on-going battle with contemporary apparel manufacturing. 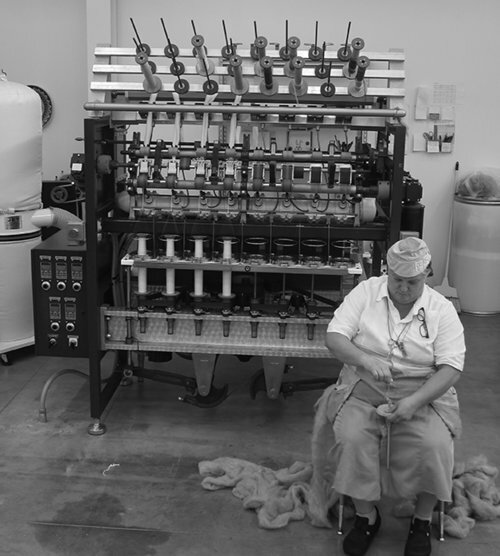 In video, photography and artifacts, the exhibition makes space to witness Frau Fiber's attempt to spin yarn, knit a tube sock and knit a sweater as fast as a machine. This series of textile productions are inspired by the folk lore of the ultimate working-class hero: John Henry. Henry, who was immortalized in verse and myth in the 1800’s, fought and lost a valiant battle against the drill machine that took his life and ultimately replaced the jobs of tireless railroad workers. The exhibition is curated by Frau Fiber’s archivist and biographer, Carole Frances Lung. This exhibition is supported by East Bay Heritage Quilters. 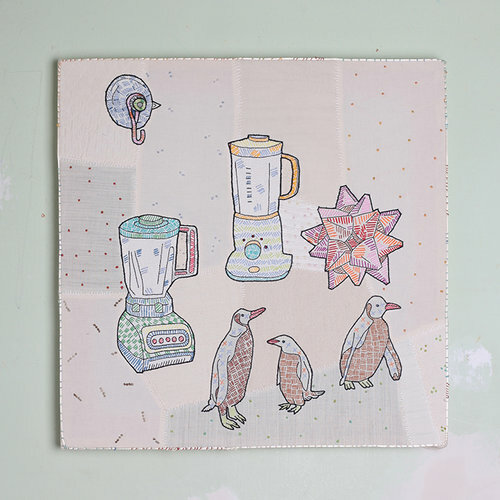 Artist Thomas Knauer is interested in the social and cultural implication of making a quilt. For him the decision to make a quilt is already a type of activism, a reflection of a desire for something more personal, a refutation of the generic and the disposable. The quilts on display stem from that fundamental premise, and translate specific concerns into material form, specifically quilts that are actually used on a daily basis; they explore the implications of addressing a wide range of issues within the intimate space of the bedroom, what it means to bring global concerns to the home. 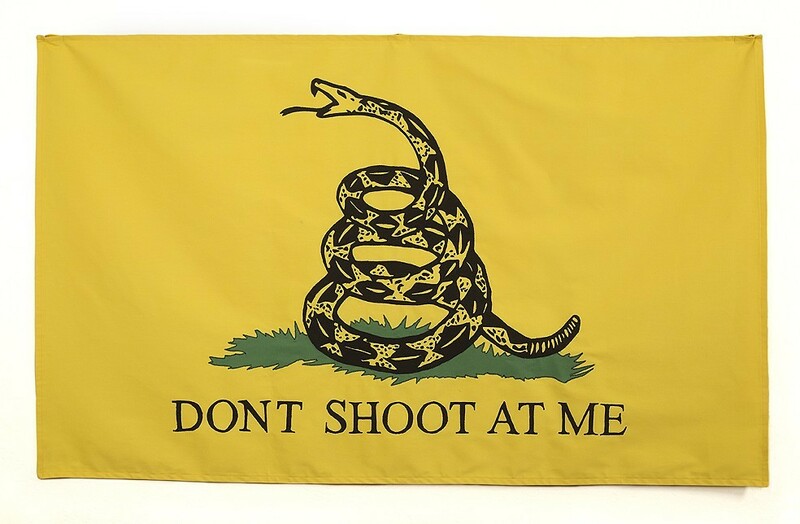 These quilts then become less about public expression and more about insuring that one’s personal ideals do not slip away into the abstract, perpetually overwhelmed by the endless cycles of crisis that surround us. 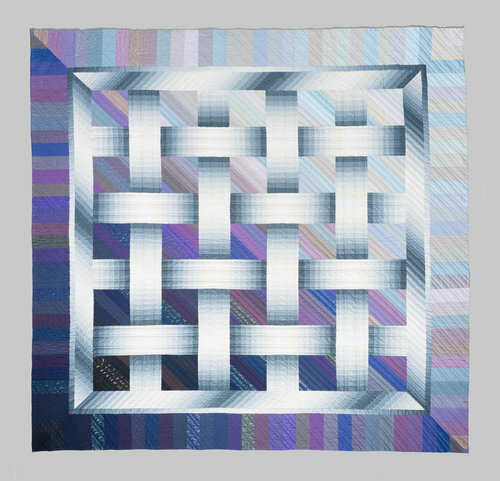 Through these quilts the political is tied to the personal, ideals are made concrete; each quilt becomes an everyday reminder of the manifold challenges confronting us, and as a prompt to advocate for a world we hope to make better. SHOJI TABUCHEESE is the 2017-2018 textile-based projects of Chuck Stolarek. Chuck is interested in context and the perfect spot between fiction & non-fiction. When possible, the medium is massively time-consuming and the subject matter is light and unexplained. The effect is laughter and confusion. Chuck is a 2002 graduate of Rhode Island School of Design’s furniture design program. His work has been seen in Sportswear International, LA Weekly, Surface Magazine, and on MTV. Director Emeritus of the Museum of Arts and Design in NY, Paul J. Smith is most noted for his groundbreaking curatorial works in the America Studio Craft Movement. During his career, he collected traditional and ethnographic textiles during his world travels that have never been exhibited before. Award wining British textile artist and designer, Vien Le Wood is the founder of Gold Spink Studio, a fashion embellishment concept house based in Brooklyn, New York. 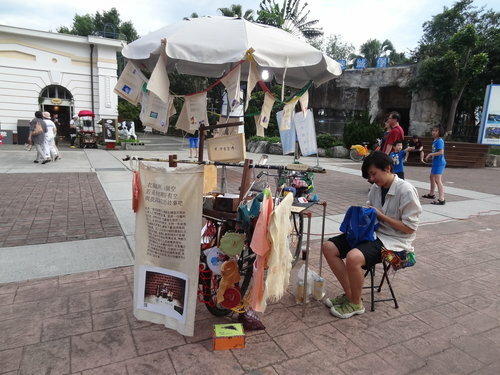 Vien has ten years’ experience in the fashion industry. Vien’s exhibition, Talismanic Tresses is based on her view of human hair which she believes it acts as a conductor to our higher consciousness and intuition.In this exhibition she intimately crafted, stitch-by-stitch, piece-by-piece, and layer-by-layer the act of embellishment with an artistic expression. Le Wood believes that through the process of being gifted precious hair and buying discarded hair, an energy exchange is created that sends the message of mortality. Image: Talismanic Tresses , 2017, Staples, copper, naturally dyed mohair yarn, tie dyed and screen printed human hair. 65 x 50 x 25"
A journey to preserve the traditions and culture of the Cambodian people began in 1975 with the fall of Cambodia to the Khmer Rouge. The exhibit shows classical and folk dance costumes brought from Cambodia, from hand sewn silks to painted canvas. All costumes are used by the Cambodian Cultural Dance Troupe to keep the ancient traditions of the Khmer people alive in San Jose.